Why is this bee wearing a tiny surveillance device? Glued to the back of this Australian bee is an RFID chip that can track where it goes, what it eats, and when. But this bug won't be tracking you — instead, it just might save the planet. One of the most pressing environmental issues right now is food security, or our ability to feed ourselves. And the bee is right at the center of food security concerns. Its population numbers are dwindling, partly because of colony collapse disorder, and that could mean famines. Bees fertilize many of our staple food crops, and without their help, our farms will be significantly less productive. But we still understand very little about what's causing colony collapse disorder. So scientists in Australia have decided to monitor wild bees to find out what substances they're coming into contact with, and what they're doing. Some researchers believe insecticides are causing problems, and these chips would allow researchers to see whether the insects are coming into contact with insecticides. Or whether something else in their environments is causing problems. 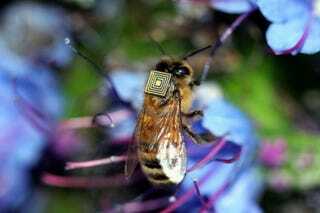 More than 5,000 bees in Hobart, Australia, have been fitted with the RFID sensors, which measure a tenth of an inch all around. They will relay data to recorders placed around hives and known food sources and will in turn send the information to a central location. This will allow researchers to build a four-dimensional model of bee behavior and movements, which will help them understand what the bees come into contact with — such as farm pesticides — and how it may play a part in their decline. "We also want these smaller tags to be able to sense environmental conditions such as temperature and presence of atmospheric gases; not just track their location," de Souza said. "Further to this the sensors will be able to generate energy from the beating wings of the insects, which will give the sensors enough power to transmit information instead of just storing it until they reach a data logger." This is one of those fascinating moments when you realize that there actually is a good use for ubiquitous surveillance. It can help us identify problems in the environment, and hopefully fix them before they get out of control. Put another way, it's time to start bugging bees.